Holt didn’t invent 24/7, but we certainly live by it. With fully stocked emergency vehicles and staff on-call 24/7, Holt can handle any disaster or emergency need you may have. We understand emergencies happen all hours of the day. Let us assist you in these unfortunate situations. We can handle temporary repairs such as boarding up of owner’s assets, securing of building, clean up of buildings interior and exterior, water extraction, and structural dry down, tarp up wind damaged roofs. We also have a dedicated team of mechanical contractors on standby to handle any plumbing, electrical or HVAC emergency. When emergencies do arise, it is comforting to call one company to handle all of your needs. Holt has the ability to handle a minor plumbing leak to a multi-unit fire. Furthermore, we will work with the adjuster to obtain the fast, fair and accurate settlement. 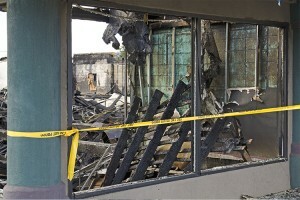 We thoroughly complete all repairs that result from the catastrophe of fire – wind – and water. All repairs are done in a timely and professional manner so you can stop worrying about the damage and start planning for the future. Put us to the test. You will not be disappointed. Damage caused from a fire can be the most catastrophic and scary. Holt has 29 years of experience assessing and restoring structures that have suffered smoke and fire damage. We know what to look for and fix to ensure your building is restored to a safe structure.